Aphrodisiac Essential Oil Blend diluted in Massage Base (ready to apply). This earthy, masculine blend includes those essential oils historically used to increase male potency while deepening sexual interest and responsiveness in both partners. Ready to use - premixed with our Massage Base Oil. 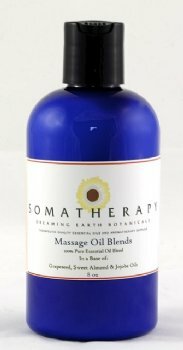 A blend of 100% pure Essential Oils: Cedarwood, Clary Sage, Frankincense, Jasmine, Ho Wood, Sandalwood, Vetiver and Ylang Ylang in our Massage Base (a combination of Sweet Almond, Grapeseed and Jojoba Oils).